We woke to a clear, mild and sunny day. What a change! Most of the snow has gone and only a few patches of ice remain on the towpath. It’s already starting to get quite muddy so tomorrow’s planned walk might be interesting. There may have just been some success with yesterday’s effort to glue the chain to the base of the paint pot. This morning the pot was tipped upside down and to my surprise the adhesive held the chain. The adhesive is still slightly ‘green’. 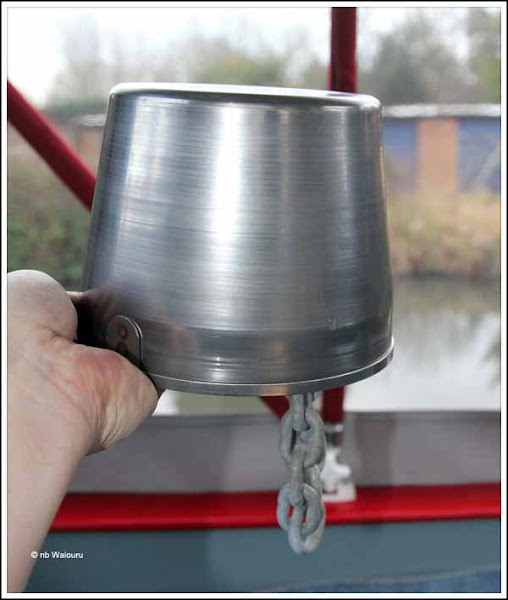 As you can see the chain hangs slightly below the rim of the inverted paint pot. As I wrote yesterday; it would probably be a good idea to wrap something around the tape to prevent it from rattling. There is a short scrap of foam pipe lagging in the side locker which will probably suffice. Just before lunch Andy (Marina Manager) came calling. He requested we move off his mooring as he needs it for another boat which has some work requiring completion. He’s perfectly within his right’s to request we move as there’s nothing he can do about the outstanding paintwork until the weather improves. We had already agreed to move on should he require the space. However we had been hoping to stay on the mooring until the end of the month. 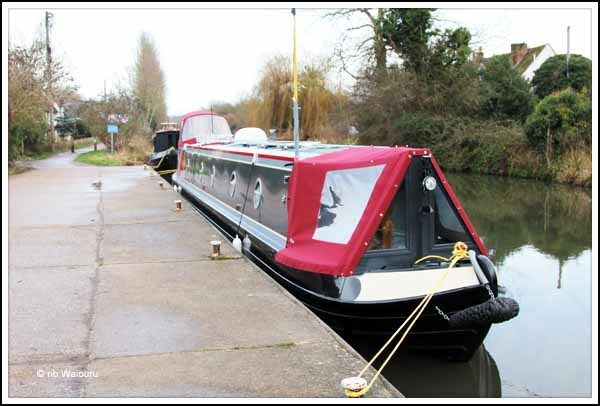 Unfortunately he didn’t have an alternative mooring on the wharf so our time as continuous moorer’s has come to an end! At least it was a good day to move. After lunch we emptied one tank and filled another. Jan emptied our rubbish into the large bins and we prepared Waiouru for a short cruise. As we don’t want to move too far the two of us decided to go for a walk and look at the towpath above Aldermaston Lock. On the way Jan stopped to talk with some fellow boaters moorers and then suggested to me we might moor Waiouru in the pound below the lock for the night. She would then do the washing in the morning and top up the water tank from the tap on the adjacent facilities block whilst I went for a walk. It seemed a reasonable plan……. until the lift bridge was raised and another boat cruised into the pound to moor on the spot we had just decided upon <drat>! Back to Plan A. Go through the lift bridge and up the lock to moor on the towpath. However when walking back to Waiouru we realised there was a perfectly good (and vacant) mooring on the CRT water point immediately outside the Cafe and only a 100 yards from our old mooring. A prime spot! We could go from being continuous moorer’s to mooring on a water point……. Just the way to start your boating. OK…… I should probably sooth any ruffled feathers. CRT closed the cafe last October as the site is being redeveloped. When they closed the cafe the water supply was also disconnected. So there is no water available from the waterpoint! But just to make sure we don’t annoy fellow boaters we will move to a towpath mooring above the lock tomorrow. I’ve just had another thought……….. It’s going to take a long time to cruise the entire inland network if we only move 100 yards every day! Not sure if you're reading about us, but we are still CM'ers! Canal is still frozen solid here but towpath muddy and slushy!! I just want to move now and top up with water! Cruising 100 yards a day will solve the problem with the paint going off.